Due to the popularity of having a domestic pet, this question plagues thousands of people across the country. Currently, 48 percent of homes in the United States own dogs and 38 percent own cats. While they are adorable, these animals run the risk of damaging your flooring via scratching, shedding, and having accidents. However, just because you have a pet doesn’t mean the appearance of your home has to suffer. 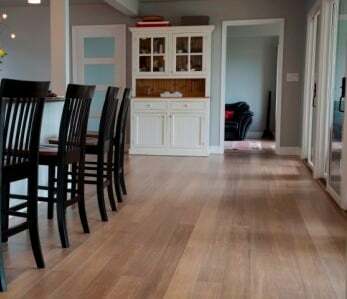 There are plenty of flooring options that can withstand the wear and tear that your pets dish out without staining, turning dull, and becoming scratched. By choosing flooring with these qualities, you can avoid permanent damage caused by your little monster. Fortunately, the pet-friendly floors on our list include these features without sacrificing style. If you’re looking for a “warm underfoot” natural hardwood floor that’s also eco-friendly and ultra-durable, look no further than bamboo. Held in high regard by interior designers and homeowners alike, bamboo flooring is one of the best options for dog and cat owners. Due to its extreme hardness even the largest of dogs and cats can’t scratch it, and it provides 24 hour spill-protection against accidents. As a naturally antimicrobial material, bamboo will also help keep your house free of mold and other allergens. When deciding which type of bamboo to choose, for pets we suggest strand woven bamboo which is around 3 times harder than oak. 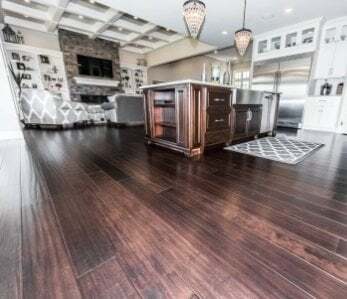 You also typically don’t have to worry about refinishing bamboo floors because strand woven bamboo is so much more durable than traditional woods. As a bonus, bamboo is a rapidly renewable resource due to its quick growth rate, which makes it great for the environment. For this reason, it is also far more affordable than other hardwood options. 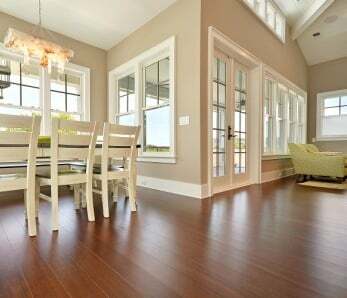 There is a wide array of discounted bamboo flooring in a multitude of different surface treatments, colors and styles. 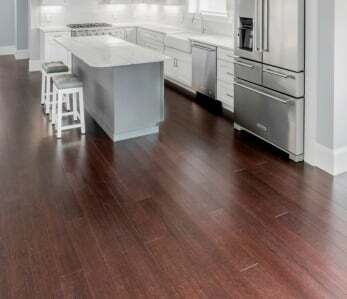 To find the look that is right for you, you can choose from a number of natural bamboo flooring options such as hand-scraped, engineered, and click-lock floating floors. 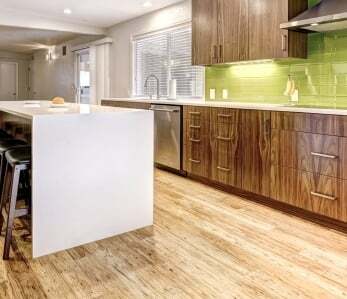 Luxury vinyl flooring can imitate the look of natural stone or hardwood for a much cheaper price. This flooring option is durable enough to resist scratches from your dog or cat’s claws while also feeling soft on their paws. You won’t have to worry about them sliding around on its smooth surface as it also provides good traction to keep them steady. Luxury vinyl is a popular choice for many pet owners for a variety of reasons. Not only is it easy to clean, but it also promotes low levels of allergens. In addition, many types of luxury vinyl are water resistant, and there are even waterproof options. Due to its durability, tile is a popular option among pet owners. When you invest in tile floors, you don’t have to worry about your floor getting scratched. In addition, its water-resistant and stain-resistant surface makes it very forgiving towards any of the common messes that accompany pet ownership. However, there are a few downsides to this type of flooring. For example, tile is very hard and cold, which can be uncomfortable for pets to walk and rest on. In addition, tile reflects sound, which can amplify the loud noise of your pet running around on its surface or barking. Stone is a logical flooring choice for pet owners as it is water- and stain-resistant. Plus, its smooth surface makes it very easy to clean. However, much like tile, stone does not retain heat. Due to this feature, it can be uncomfortable for your pet to rest on. If you decide to install stone flooring, you will want to purchase a few rugs and a pet bed to keep them comfortable. Cork has a number of attractive qualities that pertain to pet owners. For one, it is hypoallergenic. This means that it repels pet hair, dust, and other small particles, which makes it very easy to clean. It also has antimicrobial properties, which organically fend off the growth of bacteria, mold, and the colonization of small insects that your pet may bring in from the outdoors. Owners of noisy pets will appreciate its sound-absorbing qualities while pets will love its warm, pliant surface. However, cork is not the most scratch-resistant flooring on the market. If you choose to get cork floors, you should regularly trim your pet’s nails to avoid damage. Now that we have addressed the best flooring options for dog and cat owners, here are the ones you should avoid. If you currently have one of these floors and are thinking about getting a pet, you may want to consider switching to one of the options listed above. While carpeting is a relatively inexpensive option, it is one of the worst flooring choices for pet owners. Due to its absorbent nature, it stains very easily. In addition, it is much more difficult to clean compared to smoother flooring options. Laminate flooring may be durable, but it is also very slippery. Smooth and high gloss laminate floor is especially dangerous for pets because its slick surface will cause them to lose traction when they walk. This should be a big concern for pet owners because sliding on the slippery surface can cause your cat or dog’s hips to shift in an abnormal way. Over time, this can seriously harm your pet’s body. Ultimately, your dog or cat’s claws will end up covering your hardwood floors in scratches. While there are a few extra-durable options, such as hard maple or Brazilian walnut, they come with a pretty steep price tag. In addition, hardwood floors are not very water resistant. If your pet tracks in liquid or has an accident in the house this could cause permanent damage to your floor’s surface. When it comes to pet-friendly flooring and maintaining your house’s style, there is no reason why you should have to choose between the two. Thanks to these durable flooring options, you can have it all.